Chickpeas, also known as garbanzo beans, have a lot to brag about nutritionally speaking! 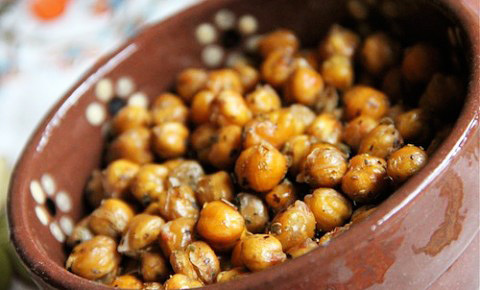 Roasted chickpeas are a fabulous and healthy snack. Many recipes like this one, toss the chickpeas in oil and seasonings before baking and this yields a slightly softer texture. If you prefer a crispier texture, simply add the oil and seasonings after they have baked. The additions are endless – garlic, salt, cayenne pepper, garam masala, Parmesan cheese, and the list goes on. Using a spray olive oil helps minimize the amount of oil used in the recipe, keeping it very low in fat. A tasty, crunchy snack that is both low fat & healthy! After rinsing, blot chickpeas well with a paper towel to dry them. Place chickpeas on a rimmed baking sheet and spray lightly with olive oil cooking spray. Add seasonings and toss to coat, and bake until golden and crunchy for 30-40 minutes. Toss the chickpeas a few times during cooking. Watch carefully toward the end of cooking to avoid burning. There are no dates in the recipe! It uses date paste which is in the recipe along with a link. Ok, I didn’t realize. Thank you!